The right to due process is a cornerstone of our commitment to freedom and fairness. The U.S. Constitution provides the right to due process, habeas corpus, and equal protection under the law to all people in the United States. Ensuring that every person in the United States is guaranteed fair treatment and due process means that there is a presumption of innocence following arrest. However, our due process guarantees have often been tenuous in practice. Current pre-trial practices have the effect of coercing low-income defendants into pleas even when they are innocent. Furthermore, detention should generally be avoided for immigration-related matters. Low-income defendants are often forced into imprisonment before trial because they are unable to provide a monetary bond. However, one of the greatest predictors of the final outcome of a case is whether the defendant was detained pre-trial. Detention increases the likelihood that the individual will enter a guilty plea, increases the length of the individual’s sentence, and increases the severity of the charge that the person takes. To protect the right of everyone to fair treatment when facing deprivations of liberty, we must restore principles that recognize the presumption of innocence. 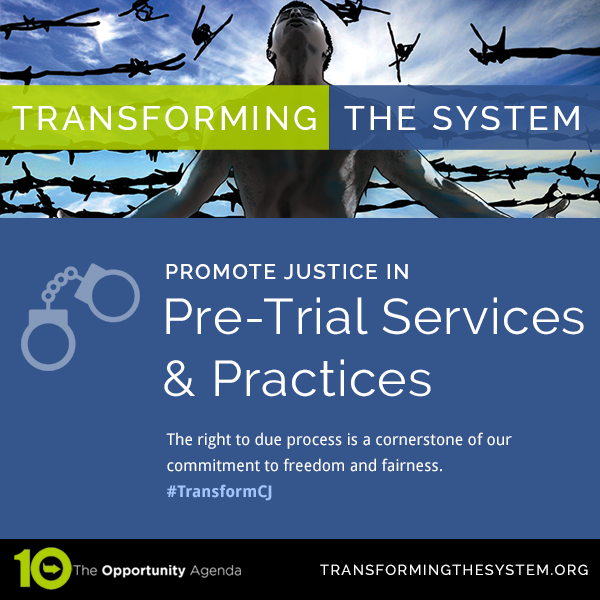 Pre-trial practices should encourage fairness, avoid incarceration where possible, and emphasize diversion to outside programs over incarceration. Detention and money bail should only be imposed when an individualized assessment of the involved party requires it. Courts routinely impose money bail without regard to a defendant’s financial resources, the risk the defendant poses, or possible alternative conditions of release, keeping presumptively innocent people incarcerated, sometimes for years. Legislatures should abolish cash bail requirements. Legislatures should pass legislation that prevents people from being unnecessarily detained, including mandating the use of warnings and citations rather than arrests in appropriate situations, and establishing time limits to allow the speedy processing of arrested individuals with real consequences for courts that fail to meet these limits. Legislatures should guarantee that defendants are provided with counsel prior to bail determinations. Effective counsel is crucial to ensuring that there are fair outcomes, especially for misdemeanor cases, which are often indigent defendants’ first point of entry into the criminal justice system. Early access to counsel may be critical in avoiding pre-trial detention, refining the defense, and preventing downstream rights violations in the enforcement of sentences that include fines and fees. Legislatures should ban for-profit pre-trial agencies. The for-profit bail bond industry has at times profited by exploiting pre-trial defendants and charging exorbitant bonds. The judiciary and judicial ethics committees and organizations should encourage individualized bail determinations based on actual ability to pay that ensure that individual defendants are not being incarcerated for poverty and are instead being assessed for actual risk. This should include providing judicial education on the appropriate role of bail and court-based risk-assessment programs where needed. The judiciary and judicial ethics committees and organizations should encourage the use of release on personal recognizance or alternative conditions of release to manage pre-trial risk. Prosecutors and prosecutor organizations should ensure that prosecutors are not employing pre-trial detention as a coercive and potentially unethical trial strategy to pressure defendants to accept unfair plea deals through the threat of lengthy pre-trial incarceration; and create metrics of success that do not rely on the number of prosecutions or rate of conviction. Community members, advocates, and activists should partner with legal aid organizations and other indigent defense organizations to monitor prosecutorial practices and demand that prosecutors who frequently misuse bail to coerce guilty pleas are disciplined for ethics violations. Legislatures should pass legislation that creates non-arrest and pre-booking diversion programs as alternatives to incarceration and conviction. However, these programs should not be used as a tool for the heightened policing of low-income communities. They should be viewed as an alternative where arrest and criminalization would be the only other workable alternative. Where cash bail is not eliminated, legislatures should pass legislation that minimizes the harms of cash bail by abolishing bail schedules, bail minimums, and bail bondsmen. Instead, legislatures should allow defendants to pay a cash deposit directly to the court. Washington, D.C. has a robust pre-trial services program that rarely relies upon incarceration pre-trial. About 90% of arrested people are released pre-trial. The right to due process is a cornerstone of our commitment to freedom and fairness. The U.S. Constitution provides the right to due process, habeas corpus, and equal protection under the law to all people in the United States. 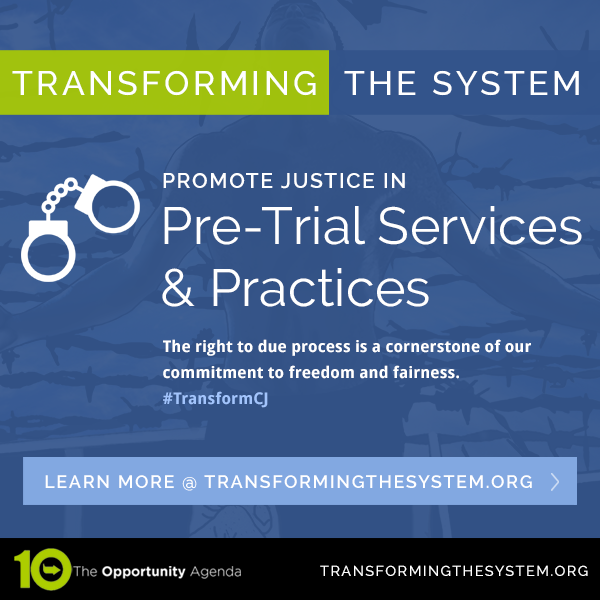 These principles are central to our system of justice. However, our due process guarantees have often been tenuous in practice. Current pre-trial practices have the effect of coercing low-income defendants into pleas even when they are innocent. These practices often force people into jail or prison before trial if they can’t pay bond. And we know that being imprisoned increases the likelihood that someone will enter a guilty plea, increases the length of their sentence, and increases the severity of the charge that the person takes. To protect the right of everyone to fair treatment when facing imprisonment, pre-trial practices should encourage fairness and emphasize alternatives to imprisonment whenever possible. Detention and money bail should only be imposed when an individualized assessment of the involved party require it. Urge your state Legislature to pass measures that abolish cash bail requirements; encourage the use of warning and citations rather than arrests; prohibit for-profit pre-trial agencies; and require that defendants be provided with counsel prior to bail determinations. Equal Justice Under Law, which engages in litigation and advocacy to “reform the structures, norms, and incentives that create and perpetuate violations of fundamental rights,” specifically focusing on the misuse of money bail to detain individuals pretrial.